Designed to resist high G-forces using powerful motors and IMUs, the Ronin-MX is engineered to maintain stability and hold horizon when mounted to an aircraft or a vehicle. When mounted to the Matrice 600 aerial system, it communicates directly with DJI's flight controller. When attached to vehicles, it connects to an optional GPS module that allows it to stabilize actively for a smoother shot. A redesigned structure moves the Ronin-MX battery from the back to the front. This centers the weight of the camera, minimizing instability when flying directly forwards. It also dramatically increases the Ronin's agility and ability to handle rapid movements or high-G situations. A combination of stronger motors and ESCs makes the Ronin-MX 50% more powerful than the Ronin-M. This additional stiffness and power allows the system to better withstand wind resistance, when mounted to moving vehicles and aircraft, as well as more rapid movements. The separately available Ronin Wireless Thumb Controller makes controlling the Ronin-MX easy and intuitive, enabling the capture of shots that would otherwise be impossible for a single operator. A wireless 2.4 GHz remote controller is included with the Ronin-MX enabling a second operator to remotely control pan, tilt, roll, and other functions. With Top Handle, x2 Screw on Top Bars and x2 Hand Grips. 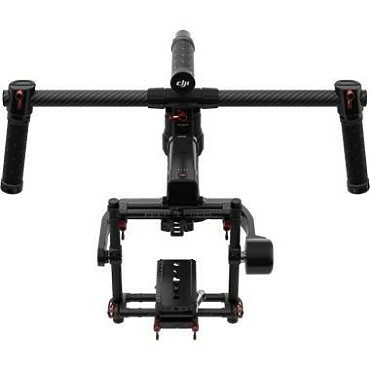 Hire the DJI Ronin MX Gimbal from Procam. Best service and rental rates for the DJI Ronin MX Gimbal and all cameras, lenses, sound, lighting and grip.